What makes people stand out when it comes to having good finance habits? Paying their bills on time, avoiding interest charges and overage fees, and keeping their debt to a minimum are just some of their common characteristics. These people are usually savers, not spenders. Though they may not have millions of dollars in the bank the money they do have is managed effectively and wisely. Your salary doesn't need to be twice as much as your neighbor in order to have financial stability. 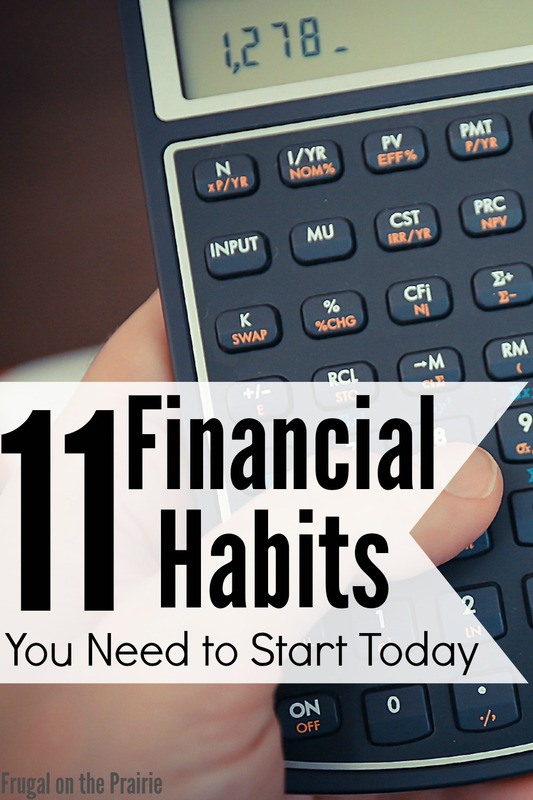 Just follow these 11 healthy financial habits. Having a budget is the first step in every organized personal finance plan. Think outside of the normal rent, car payment, and insurance when you start listing your expenses. You need to take into account the hair salon, the weekly Sunday brunch, Netflix costs, and so on. Don't forget a single $2.50 coffee out! To simplify things in our home we use an umbrella amount of $50 to cover any miscellaneous "fun" spending we do. 2. Never spending more than you have. With easy access to credit cards it can be tempting to spend more than you have in the bank. I'll be honest, credit cards have a lot of great advantages! I especially love using cash back bonuses, free FICO scores, and spending analyzers, just to name a few. But you know your spending habits better than anyone else. If you feel like the allure of shopping will be more than you can resist, cut up those credit cards immediately! 3. Paying all of your bills on time. There are so many ways to make sure a bill is never paid late. You can set a recurring reminder on your phone, set up automatic bill pay, or frequently check all of your bills and accounts. I check my account balances often and still insist on receiving e-bills for all of my expenses. I’ll flag each message until I do my routine paying of the bills at the beginning of each month. I have an easy-to-navigate yet detailed budget spreadsheet that keeps me in line and on top of things. It’s been years since I forgot a payment. Organization and awareness are key to paying your bills on time! 4. Participating in "Lazy Saving." I refer to automatic transfers to a saving account as “Lazy Saving” because it all happens without any effort on your part. My husband (boyfriend at the time) and I struggled for who knows how long to actually set aside significant amounts of money. There was always a plan but never an action. Even if you're actively saving right now, go ahead and set up an automatic transfer to your savings anyway. After a while, you'll be so used to the money quietly moving from your checking account that you'll never even notice it's missing. 5. Doing your research and purchasing wisely. You see a new pair of shoes you want to buy while you're out shopping. Your instinct is to purchase them immediately, right? Immediate satisfaction in shopping can sometimes be the reason you overpay on something. Take a moment to browse on your smartphone or at home to make sure you’re getting the best price available to you. I always check Amazon because of our Prime membership and will usually pay anywhere from 5-20% less than any in-store price. This is especially true for books and clothing. To me, it’s worth saving 20% to wait for the product to be delivered to my home. 6. Communicating with your partner. You can’t have a healthy, successful marriage without communicating about your feelings. The same rule goes for your finances. Hiding money, keeping secrets, or never knowing how much your partner is spending/saving are just some of the ways things could go wrong. If you feel there are money issues in your relationship, speak up! Saying what's on your mind is less frightening than heading into financial troubles because you didn't say anything at all. 7. Never letting money slip through the cracks. The sign of a savvy personal financier is someone who can identify exactly where their money is going. You should always know how much is being spent and where. It's the quickest way to pinpoint weak spots in your budget. Once you start going through your expenses you may be surprised with the results. We were alarmed to find that we had spent more than $6,000 in restaurants and eating out in one year. We haven't let our money slip through the cracks since then! 8. Checking your balance every day. Checking your balance doesn’t take much time and it can help you save yourself from unnecessary spending or overdrawn fees later in the day. If you know how much cash you have then you know exactly where you stand and where your money should go from there. I check my balances every single day and also check any bill due dates while I’m at it. 9. Paying down any debt you have. Debt is too often a problem whether you're in your 20’s or beyond. And it will certainly take advantage of you if you’re not paying attention. I cringe when I think of someone having an interest charge on an unpaid credit card balance. Paying off credit cards and loans should be your number one priority because of the interest they accrue and the effect they can have on your credit score. I talked about how to get an 800+ credit score and managing your debt-to-credit ratio and paying off balances in a timely manner is key. However, don’t beat yourself up if you find debt unavoidable. Graduating from college was incredibly important to me. I both worked and attended school full time while applying for as many scholarships and grants I could get my hands on. But it still wasn’t enough to cover all of my college-related expenses. I could’ve worked overtime and graduated later but I'm so glad I didn't. Avoiding the debt wasn't worth putting my education on hold! 10. Building an Emergency Fund. How many times in your life will you need to dip into your Emergency Fund? Exactly. There’s no way to know for sure. You'll never know ahead of time when you're going to need the fund and that's what makes it so important! I wish I could label you as infinitely lucky so you could sail through life without the need for an emergency stash of cash. Unfortunately, there may be a car problem, a hospital bill, or any number of I-didn’t-see-that-coming expenses. Save now so you’re protected later. "I've got time to save so why worry about it?" So many of our youth think like this but the years we have to save money will, unfortunately, fly by. Start building your retirement accounts yesterday! Putting it off even five years makes such a difference in the amount you’ll get to live off of in your old age. If your budget is strapped and you can’t set aside large contributions, it’s not the end of the world (though not a prime situation, if I’m being honest). Saving even the smallest amounts every month will eventually add up. 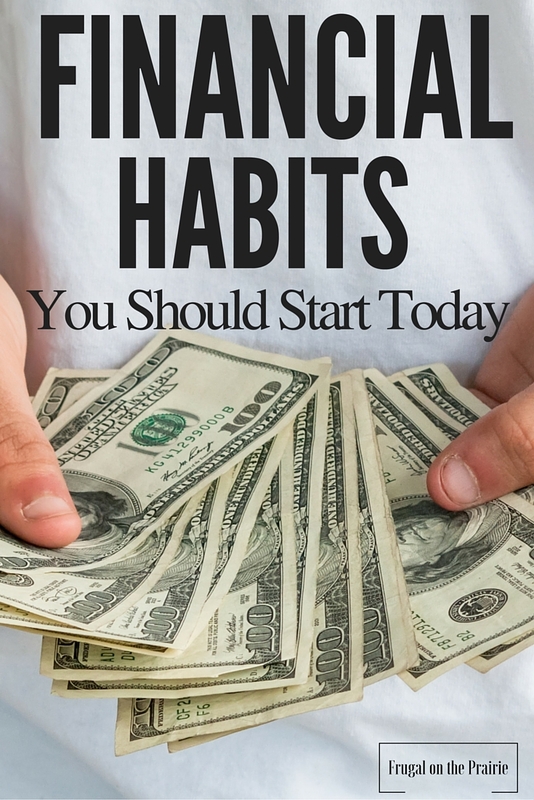 Financial habits can be adopted, you don’t have to be born with them. When I was younger I lived by the mentality, “This is how much I have so this is how much I can spend.” I cared little about retirement or savings until I was in college. The way I handle money now is the extreme opposite of how I was back then…thank goodness! You may feel like you'll never be able to replace your bad habits with good ones, but you can! It’s never too late to change the way you manage your money. What financial habits do you have? What is your strongest quality when it comes to handling your money?